review submitted by Lavender Lori I guess I’ve been sleeping under a rock the past 6 years because I had never heard about Big Sky Big Grass until the first Friday night of February while I was enjoying one of my favorite Missoula bluegrass bands; Lil’ Smokies at the Old Post. Pete, their guitarist mentioned they were headed over to it on the weekend. When he said who’d be playing I had no choice but to go. By 1:30 I was on the road, dog called dibs on the passenger seat, and we picked up a young couple on the freeway entrance with a huge sign that said Big Sky. They braved the drafty , topper covered back. We arrived an hour before the show started. I grabbed a seat on the outside isle of the 4th row, thinking I could not believe my luck. There were 50 people in the room. The Two Bit Franks out of Bozeman were up first. They did a fine job, had some real nice harmonies and were obviously talented musicians. It was the first time I had ever witnessed a mando-cello, which was one of their standard instruments it had a rich , syrupy sound. The room filled up as they were bringin’ it around. It was a diverse crowd, both young and old, sedate and rambunctious. I’ve gotta give a big shout out to Josh the volunteer security guard who from his post at the stage could see I was getting danced upon by the sideline crowd and set me up in a front row center seat. Thank you! 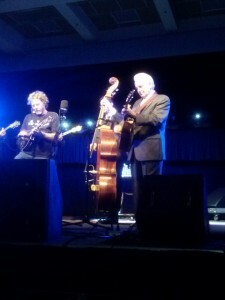 I had never seen Del McCoury before, so it was real special to be that close. It was, I must say, a pivotal bluegrass moment. This man has been gifting us with his iconic high, lonesome sound for 50 years, and we were lucky to have him here as he was to fly out to be at the Grammy’s next day. Del forgot the lyrics a couple times but being as he’s nearly 75 we’ll give him that. And hey, it’s live,right? No matter, they played right through the rough spots, Del laughed it off and complimented the audience often, warning that they knew the words so well they might get pulled up on the stage to sing. The McCoury’s are some of the cleanest pickers around. I’ve never heard the likes of such clean, sharp and stylish bass playing. And damn if he wasn’t charming. Though the fiddle player is the smallest man in the band he’s got the deepest voice, which we heard in the harmony laden tune “Get down on your knees and pray.” The band mixed it up with some old time traditionals, tributes, originals, and some covers-by far the crowd’s favorite was Richard Thompson’s “Black Lightning”, and there were many requests for “High on the Mountain” which they played. Personally, I award this band the best dressed band in bluegrass. They all looked like a million bucks; nice similar colored suits and lovely silk ties.